I am Totally not into getting my photograph taken, especially while on vacation, so I am the last person on Earth who should criticize the way other people come out in photographic portraits. 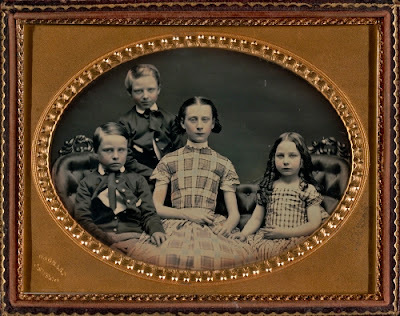 I don’t know which is worse: the “geek-trying-to-look-casually-cheery” look that I achieve when someone points their phone at me, or the “is-that-thing-gonna-explode?” look on the faces of these poor kids from 150 years ago? From its very inception (1830s), photography was perceived as an ideal medium for portraiture. After the creation of the Daguerreotype process in France, Americans immediately learned the process, launching portrait establishments as early as 1840, earlier than in Europe. A French process introduced to the United States in 1839, the Daguerreotype was by far the most popular photographic medium in the early days of portraiture. Within three years it was wildly popular in the United States. The Daguerreotype produced a one-of-a-kind image that developed on a highly polished silver-coated copper plate. The image produced was a positive. Because the metal plate was delicate, subject to damage from fingerprints or moisture, it was usually mounted in a case under glass, often in a leather or velvet bound cover. Mounting a portrait likeness in a special case to protect it harkens back to the miniature or silhouette that were treated in a similar fashion. Of course, there are very few Daguerreotypes in which the sitter is smiling or animated, due to the long exposure time and complicated sequence of actions needed to make the exposure. When Daguerreotypes first appeared, the sitter had to be still for up to fifteen minutes. Head clamps were often used to keep the sitter from moving, as may be the case with these children. By the 1840s, American photographers had shortened the exposure time to a little over a minute if the size of the plate was reduced. It was still a long time to sit still. George Barnard, born in Connecticut, is most famous for his Civil War (1860–1865) photographs of Sherman’s march through the Confederacy. However, he established his reputation as a photographer in Daguerreotype portraiture. He opened his first studio in Oswego, New York in 1847. From there he became nationally renowned for his Daguerreotype portraits. There is only a little more joy in the faces of these children than there was in the other fashionable form of Daguerreotype portraiture, that of dead people. Although exposure times diminished rapidly during the late 1800s, I still smile when I see portraits like this with the “just-returned-from-the-funeral” look on the sitters’ faces. Because this portrait was taken by an Aesthetic Photographer, she may have desired this dramatic demeanor. Aesthetic Photography, or Pictorialism, developed in the late 1800s by artists who felt that the wealth of detail capable in photography was stale and unimaginative. They sought to elevate their photographs from simply a document to fine art. Gertrude Käsebier, trained as a painter in Paris, became interested in photography around 1894. By 1897, she had opened a portrait studio in New York. 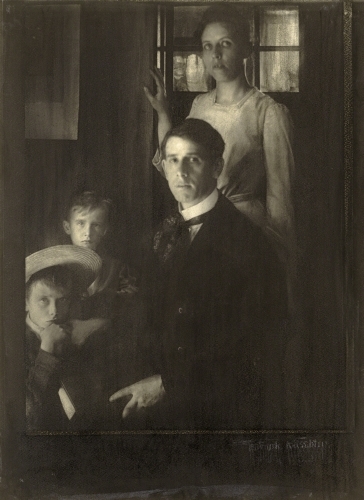 The soft edges, atmospheric lighting and thoughtfully posed portrait of fellow Pictorialist Clarence White (1871–1925) was achieved with the gum bichromate process. Platinum on the paper was covered with gum Arabic. The negative would be washed with water and manipulated with a brush, pencil, or eraser in order to alter the background, erase detail, or reduce the surface to the tonality of a charcoal drawing. Water-based dyes could also be introduced to the print during the process. Like many Pictorialists, Käsebier preferred the platinum process because of the range of tonalities and nuances in hues available. In both her manner of composing the sitter and then manipulating the negative, she intended her portraits to vie aesthetically with those executed in paint. She was considered by other aesthetic photographers of her time to be the best at representing the personality of her sitters.